Fabulous red and fabulous style, a feast for the eyes. Quel défilé! I can't imagine beholding so many works of art in one line of models! I like how he used silver/muted grays for contrast! Parfait! I love red...look at those eyebrows! This is too strange...my code to post this "redless"
I know this will give you wonderful inspiration for your next beautiful wrapping! We will shadow him together darling...the man is a genius. I cannot image how he does this season after season...really. Amen sister, amen. It's like wrapping your body & soul in the most beautiful way possible. So magical, sensual & theatrical! This is true Haute Beaute Sande! 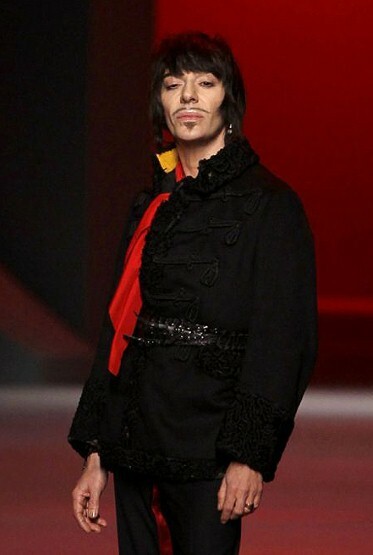 Galliano has a way to touch all my six sences. Here here!! 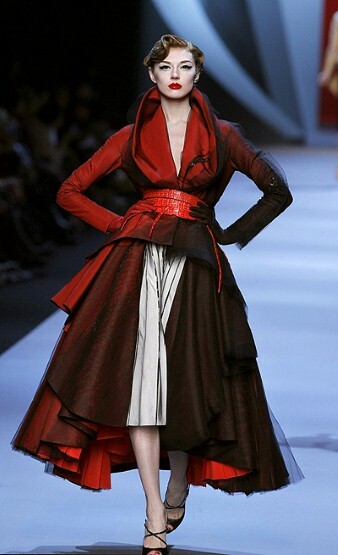 Fashion at this level is most definitely art and Galliano is an artist of the first order. This collection is mind bogglingly beautiful!! It's what couture is all about! Love your blog. Just found you via Renae. I've signed up to follow. I'm in love with Miss Daisy. what a cutie pie? She reminds me of my Cappi 14 years ago. Every single one of those years with her has been all good! What a fun blog! These pictures are such art.....very theatrical and love the rich colors! Please check out my new blog about the building of our new home and my love for design and decor.